If you consider your dog or dogs to be your best friend or one of your children, we get it and so do a lot of our event organizers and attraction owners in Hendricks County. With more and more people looking for things to do with their dogs, we recently created a page on our website dedicated to our four-legged friends. Today though we want to focus on dog-friendly events, attractions and activities you can find in Hendricks County this fall. So dogs: grab that leash and collar and feel free to invite the rest of your family as well. We have two big events designed for dogs coming up in October in Hendricks County including Pups on the Patio and Dog Daze at the Maze and another in early December -- Clay Paw Print Ornament Day -- that I will throw in here, too, which stretches the fall theme but who cares. Pups on the Patio - This free event from 11 a.m. to 1 p.m. Oct. 6 on the patio of Claddagh Irish Pub in The Shops at Perry Crossing mall in Plainfield offers numerous vendor booths, a pet costume contest and product demonstrations. Dog Daze at the Maze - This annual event from noon to 4 p.m. Oct. 20 & 21 allows visitors to bring their dogs out to the best fall attraction in Hendricks County, Beasley&apos;s Orchard in Danville. The mission of this event is to raise money and awareness for local rescue groups in addition to allowing families to have fun with their dogs at the farm. 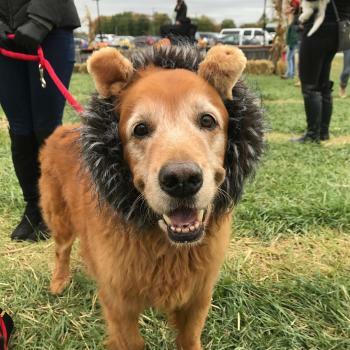 Let your four-legged friend help guide you through their giant corn maze, enjoy a hayride out to their pumpkin patch, participate in a pet costume contest, check out all the pet supply vendors and more. You can even adopt a dog at this event. Clay Paw Print Ornament Day - The Bisque Barn in Avon will host this pet-friendly event from 2-4 p.m. Dec. 2. Bring your pets in and the staff there will help you do the rest to make a paw print keepsake that you can hang on your tree. 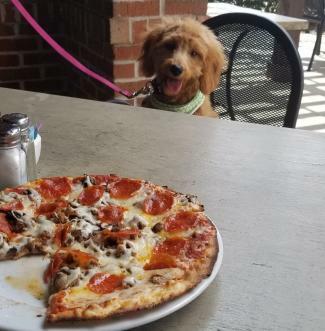 Several of our restaurants offer pet-friendly patios. You can find a complete list on our doggie page, but just a few include the Oasis Diner in Plainfield, Boulder Creek Dining Company in Brownsburg and the Bread Basket Cafe & Bakery in Danville. One of the best places in Hendricks County to visit in the fall also welcomes dogs. McCloud Nature Park in North Salem boasts some of the most beautiful fall color around. Open every day, dawn to dusk, this park features a grasshopper-themed prairie maze, a Nature Center and so many scenic hiking trails that you and your entire family can spend hours nosing around there. In addition, the park has a big festival coming up. The Fall Colors Festival from 10 a.m. to 3:30 p.m. on Oct. 20 is free and will have tons of activities. I already briefly mentioned The Shops at Perry Crossing above as one of the hosts of the Pups on the Patio event, but I wanted to touch on it again here. 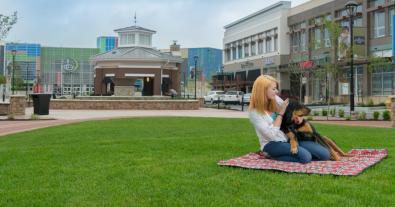 This outdoor lifestyle mall loves dogs and many of its stores, restaurants and outdoor gathering areas cater to them. Just look for the stores with stickers on their windows to determine which are pet-friendly. I finally wanted to mention the dedicated dog parks in Hendricks County. We currently have two, but another is under construction currently in the new Cardinal Park in Brownsburg and will likely open in 2019. Paw Park – Located in Avon at Washington Township Park, this park is designed to give dog owners the opportunity to socialize and exercise their dogs in an enclosed area. Dogs must have a membership. Applications can be found online at the Paw Park website. Bark Park – The Plainfield Bark Park,1007 Longfellow Drive in Plainfield, requires dogs to be registered, which involves a fee and a signed waiver of liability. You can register your dog at the Richard A. Carlucci Recreation & Aquatics Center.